The preparations for the UN Climate Change Conference (COP 23) in Bonn are in full swing. Following the beginning of the construction phase on 14th of August, the organisers have only about two months left to build an impressive array of temporary buildings in order to welcome more than 25,000 delegates and visitors. Build on an area of 35,000 square meters, the flooring will cover a surface of 50,000 square meters. 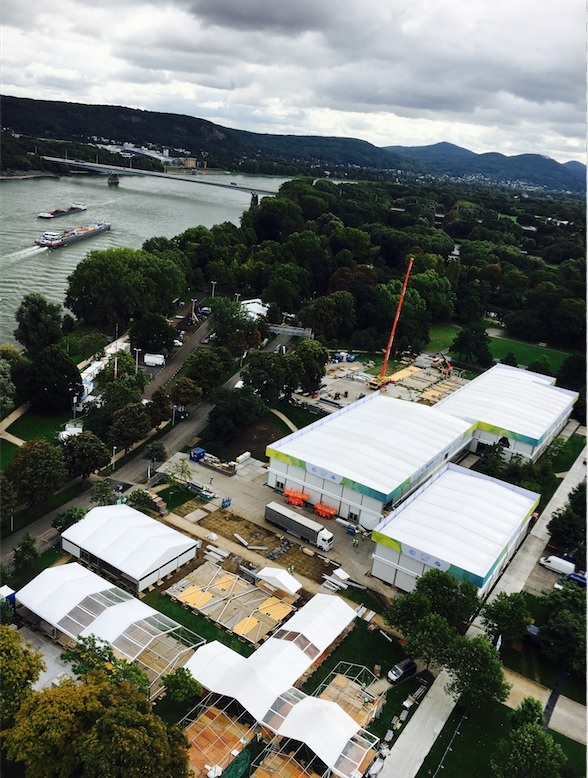 Two zones will be available during the conference: The “Bonn-zone” at the Rheinaue park, where events, exhibitions and presentation of the countries and UN organisations will take place, and the so-called “Bula-zone” around the World Conference Centre Bonn (WCCB). The “Bula-Zone” is the location where the main negotiations will be conducted (see picture below). Up to 2,000 construction workers will ensure that both zones will be ready on time. “In fact, the construction is progressing as planned and we expect to finish on time, by the end of October”, explains Franz Emde, Spokesperson for the German Environment Ministry. COP23 under the presidency of the Republic of the Fiji Islands will take place between 6 and 17 November in Bonn, Germany.